The perfect late afternoon tour to start your evening and welcome you to Florence! Tour not available on Monday as the Accademia gallery is closed. This 3.5hour tour concentrates on satisfying the eyes as well as the palate! The first half of the tour is dedicated to the great Michelangelo and his most famous statue, the David. Afterwards, the tour will be dedicated to wine tasting conducted by a certified sommelier in a local restaurant. The tour will start in the piazza della Signoria (town hall square) where the copy of David is located and you will be propelled into the time when it was carved and understand why the original was placed here five centuries ago. 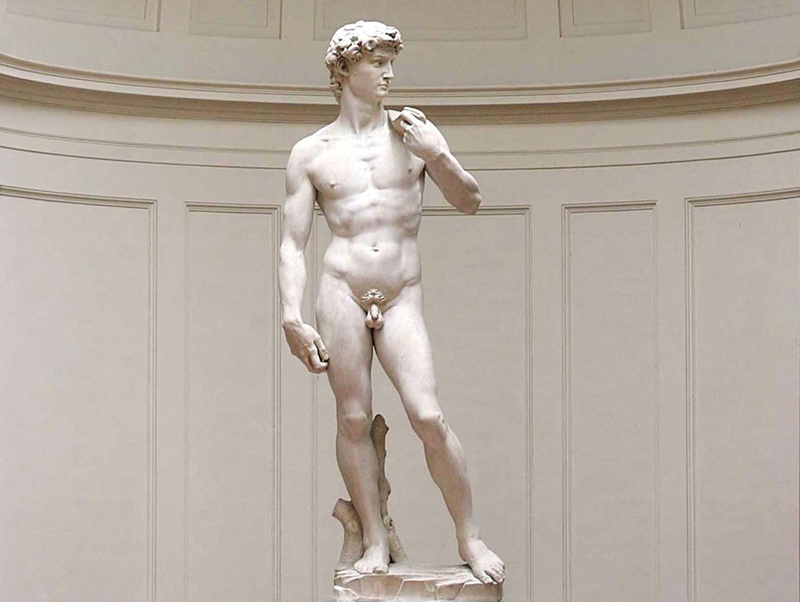 You will hear about the cultural history of the period, the life of Michelangelo and then visit the Accademia gallery to see the original David. The second half of the tour will be dedicated to wine, a wine tasting with a sommelier. Learn how to taste and decipher wine like a professional and sample some excellent varieties from Italy (four types). There will also be some food to accompany your tasting. To be determined upon booking. Please note: The above prices are for the tour only and the wine tasting and do not include the admission fees to the Accademia gallery. Admission fees to be paid on the day at the ticket office with guide. We will make the ticket reservations for the Accademia gallery ahead of time to avoid the long lines. In high season there may be an unavoidable short wait in the reserved line due to the very busy tourist period. Please note: For parties of 6 or more people Freya’s Florence will organise rental of personal headsets for use during the tour. Headsets cost 2.50€ per person. The Accademia gallery has a rule that all parties of 6 people when visiting the gallery with a guide require that all guests in the party have the headsets to hear the guide better. This rule is to reduce the noise level in the gallery. Full price admission costs 16.50€ (ticket 12.50€ + reservation fee 4€). Children between 6-17 years (inclusive) have free admission but reservation fee must be paid, 4€. Original or a copy (digital or paper form) of the passport must be shown as proof of age for free/reduced tickets to the ticket office staff upon ticket purchase. Payment for the tickets can be made by credit card or cash. The Accademia Gallery is closed on Mondays. This tour is not available on Mondays. On the first Sunday of the month all state museums in Italy are free without the possibility of making a ticket reservation. The only way to avoid the extremely long queue for the gallery is by having the Firenze card (72€ for 72hours).